1 Brain Areas in the Neuromatrix and the Changes Due to Chronic Pain. Brain Areas in the Neuromatrix and the Changes Due to Chronic Pain. Studies using functional MRI have identified six common regions activated in acute pain. These regions include the primary somatosensory cortex (S1), secondary somatosensory cortex (S2), anterior cingulated cortex, insular cortex, prefrontal cortex and the thalamus. It is these regions that make up the pain neuromatrix which Melzack has identified. More information on the Neuromatrix Theory of Pain and the Mature Organism Model can be found on the Multidimensional Nature of Pain page and on Louis Gifford's website here. In a review conducted by Lithwick et al (2013), the role of these areas in producing pain is explained in depth. The primary somatosensory cortex is responsible for sensory discrimination, determining where the pain messaging is coming from. In patients with chronic pain, a more widespread contralateral activation was observed, compared with acute pain where only the ipsilateral side was activated. Another study found that individuals with chronic pain also have a small cortical representation of S1 and implied that “there was dissociation between activation of primary sensory areas and the actual origin of pain.” This change in activation of the primary somatosensory cortex can be used to explian why patients with chronic pain are more likely to feel a more difuse pain and are often unable to specifically locate their pain, as there is a much greater activation of the primary sensory areas in these patients. This may also explian why the patient's pain may initially being in the knee but then begins to effect the hip, as greater areas of the primary somatosensory cortex are activated. The secondary somatosensory cortex (S2) is associated with the discrimination of pain intensity. There has been shown to be a coactivation between the primary somatosensory cortex and the secondary somatosensory cortex. In patients with chronic pain, there is “a bilateral activation pattern, as compared to a contralateral activation pattern as seen in acute pain.” This indicates that there is less of a representation of the initial pain and again may contribute to the widespread, vague pain described by chronic pain patients. The anterior cingulated cortex (ACC) is associated with emotional and cognitive-evaluative aspects of pain processing along with sensory perceptions due to convergence with the S1. In chronic pain patients, there is bilateral and more widespread ACC activation compared with acute pain. The authors concluded that this indicated a heightened sensation of pain in chronic pain patients as well as a shift towards a more emotional aspect in chronic pain. Whilst there is always an emotional aspect of pain, these authors concluded that due to the increased ACC activation seen in chronic pain, the emotional aspect had an increased effect on the production of pain and could contribute to ongoing high levels of pain. The insular cortex (IC) has a role in both sensory and affective perception of pain – the suffering aspect of pain. It is often coactivated with the anterior cingulated cortex. In chronic pain, there is a more widespread activation of the IC compared to acute pain. The IC is also more linked with sensory discrimination in chronic pain, rather than emotional processing. The IC’s role in suffering “ is minimised so as to accommodate the vast increase in activation that is seen in S1 and S2.” Due to the increased activation of S1 and S2, the IC has increased activation but has more of a shift towards sensory perception to help process the increased information from the periphery. This change would contribute to allodynia and hyperalgesia as seen in chronic pain. The prefrontal cortex is responsible for the cognitive evaluation of pain. Three areas are associated with pain: the medial prefrontal cortex (mPFC), dorsolateral prefrontal cortex (DLPFC) and orbitofrontal cortex. mPFC represents the affective aspect of pain, the DLPFC is involved in localising painful stimuli and the orbitofrontal cortex is a link between painful area discrimination, memory and emotion. Lithwick (2013) observed that in individuals with chronic back pain, m PFC was in a significant hyperactive state, which may reduce brain activity in other areas overall, affecting the brain’s ability to perform other tasks. Overall, the change in PFC due to chronic pain represents a shift towards increased emotional processing. In summary, research has shows that in patients with chronic pain, there is more widespread activation of the areas that are associated with the perception and production of pain. This can explain the vague, widespread nature of chronic pain. There is also more activation of parts of the brain which are associated with emotional processing in chronic pain states. This may explain some of the emotional changes that can occur with chronic pain states. Psychological basis of pain offers more information of some of the changes that can occur with chronic pain. This image shows that there is a widespread activation of cortical areas in someone suffering from chronic pain compared to acute pain. Credit: Northwestern University. Not only are different parts of the brain activated when pain becomes chronic, but there can also be smudging of the sensory and motor homunculus. Smudging refers to the changes in the brain areas devoted to detecting the stimulation of body parts and performing functions begin overlapping. This process is why some body parts may become difficult to use or other areas become sensitive compared to the injured area. For more information on this, please see central sensitisation. Flor (2003) hypothesised that this overall widespread activation and expansion of the representational zone may lead to pain perceptions in the absence of peripheral stimulation. These changes in brain anatomy are a result of increased nociceptive input from the periphery which results in the systemic and anatomical changes discussed above. Wand et al (2011) conclude that “it is likely that part of the pain experience of chronic low back pain patients is mediated by sensitivity changes within the central nervous system and the demonstrated brain changes are a probable contribution to this." 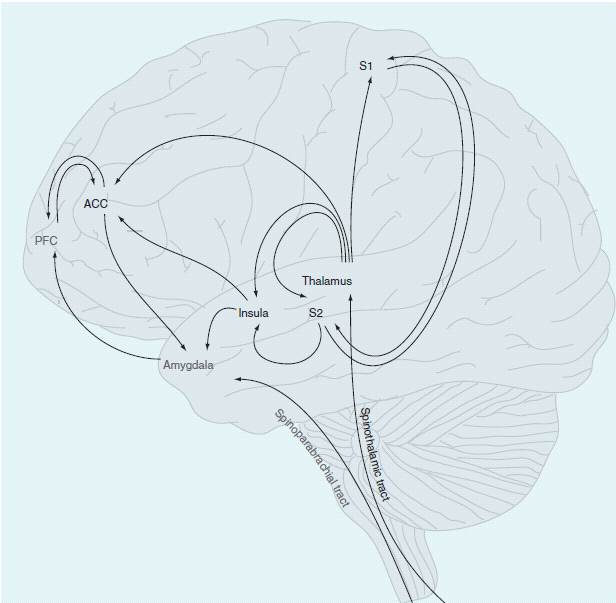 Nociceptive information accesses the cortex through multiple pathways in the spinal cord. Modulating of these cortical areas occurs due to a continuous barrage of nociceptive inputs associated with chronic pain. A study conducted by Seminowicz et al in 2011 investigated the effect of chronic pain on brain anatomy and whether effective treatment would reverse these changes. They found that in chronic pain patients, there was a decreased cortical thickness in the DLPFC, anterior insula, anterior cingulate cortex and primary somatosensory cortex. The loss of cortical thickness corresponds with a loss of neurons and a slower speed of synapses. They then treated the patient’s pain with a nerve root block or spinal surgery to determine if these cortical areas became thicker again with reduced pain. The only statistically significant finding was an increase in the thickness of the DLPFC in patients who reported a decrease in pain intensity and improvements in physical impairments. The authors concluded that more research is needed to determine if interventions targeting psychosocial rather than biomechanical components of chronic pain would result in similar recovery of cortical thickness. Working memory refers to the short term, information retention system which is essential to the skill of maintaining and manipulating behaviourally relevant information. Effective working memory function is necessary for guiding behaviour, making decisions and reasoning and planning. Chronic pain patients often display cognitive or working memory deficits and are often impaired in the performance of cognitively demanding tasks. Legrain et al (2009) developed a neurocognitive model of attention to pain which aims to explain these changes in patients with chronic pain. They explain the modes of attention selection: the bottom-up capture of attention and the top down modulation of attention. The bottom-up capture of attention is evident in the scenario where you place your hand on the cook top whilst cooking. The pain message will interrupt any other messages going to or from the brain to ensure that you remove your hand quickly, before causing further damage. The involuntary capture of pain is the most important feature of the pain alarm system to stop you from performing other activities and to focus on the pain messages and prioritise actions to prevent injury. Legrain et al (2009) reports that studies have found that attention is unintentionally captured if the pain is intense, new and threatening and this is evident in poorer task performance whilst experiencing the pain. So for someone suffering from Chronic Pain, the constant barrage of pain messages from the periphery is likely to prevent them from performing other tasks effectively, due to this interuption of attention. 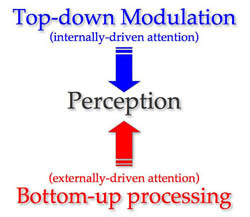 Legrain et al (2009) then explains how the top-down modulation of attention can reduce or modulate the pain response. “Numerous studies have shown reduced pain when attention is directed away from nociceptive stimuli.” Neuroimaging studies have shown that responses to painful stimuli in the brain are decreased when attention is strongly focused on a primary visual task. However, the top-down modulation may also increase a patient's attention or focus towards a painful stimulus. Attention can be more easily captured by pain if a painful stimulus occurs to a part of the body which is involved in a task. For example, if the pain felt in the hand when the patient has been asked to write or draw, the patient will report increased intensity of pain. Legrain et al (2009) conclude that in chronic pain, it is likely that there is a tendency to increase attention or focus to pain-related information and less ability to reduce pain with the top-down modulation due to expectations of a stimulus or activity being painful. However, utilising the top-down modulation of attention, perhaps by using meditation or distraction, may actually help to reduce pain. There have been a number of studies which have tried to understand how an increased attention to pain can then lead to decreased working memory. Walteros et al (2011) compared fifteen patients with fibromyalgia and fifteen healthy patients and looked at how they performed the Iowa Gambling Task and a conditional associative learning task. The results showed that fibromyalgia patients had a poorer performance than healthy controls in both tasks. The patients with fibromyalgia displayed more errors in the learning task and more disadvantageous decisions in the gambling task. Berryman et al (2013) conducted a systematic review to determine if chronic pain was the cause of the deficits in working memory. They critically appraised twenty four studies, including the study conducted by Walteros et al (2011). They found that in studies that used behavioural outcome measures, chronic pain was associated with decreased verbal working memory, decreased non verbal memory, decreased attention, decreased auditory control and decreased visual memory. However, the results of the EEG and functional MRI studies did not reflect the results of the behavioural studies. There was no difference between chronic pain patients and healthy controls when examining latency or amplitude. The authors also concluded that there was a high risk of bias due to recruitment, failure to screen for psychiatric disorders, no clear diagnostic criteria for chronic pain and lack of blinding. “Our only empirical evidence of working memory deficits in chronic pain are at high risk of bias which leads us open to the possibility that no such deficits really exist”. They recommend that for future research, studies should use sequential recruitment, apply recognised criteria for chronic pain, screen the control group for chronic pain and both groups for psychiatric disorders, blind both assessors and patients and use larger sample sizes to obtain more valid results. As Physiotherapists it is important to understand the changes that occur with chronic pain so that we are better able to educate our patients regarding their pain. Patient education in Pain Management discusses the current research regarding the education of patients on chronic pain and different factors which can effect patient education. 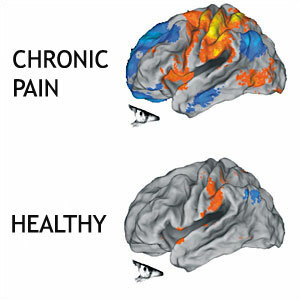 The changes in the brain that occur due to chronic pain are due to the plasticity of the neural system and the brain. It is this underlying plasticity which suggests that these changes may be responsive to targeted treatment. Moseley and Flor (2012) group these treatments into cognitive-behavioural, sensory and motor strategies. Moseley and Floor (2012) state that the goals of cognitive-behavioural treatment for chronic pain are to “increase healthy behaviours related to work, leisure time and the family; reduce medication and change the responses of significant others from solicitous to distracting or ignoring.” Patients are taught strategies such as distraction, meditation or relaxation and cognitive reappraisal along side pacing and activity planning to prevent flare ups. They are also educated about pain and the factors which lead to chronic pain and also the factors which can modulate it. Studies have shown that this therapy improves functional capacity and reduces pain, enabling the patient to establish a sense of control over pain and develop behaviours that limit the impact of pain on quality of life. Behavioural Approaches to Pain Management discussed cognitive-behavioural treatment in depth. Wand et al (2011) found that there is increasing evidence that graded motor imagery is effective in treating Complex Regional Pain Syndrome, and Moseley and Flor (2012) also support this. All three authors have also concluded that sensory discrimination training programs have been effective in reducing pain and increasing function in Phantom Limb Pain patients., Graded Motor Imagining consists of three sequential stages, laterality (recognising left and right), imagined movements and mirror therapy. The aim of this graded progressions is to work the brain to desensitise, habituate and develop function. More information regarding Graded Motor Imagery can be found here. Wand et al (2011) warns of the need to be cautious in generalising this data to the chronic low back pain population, as significant research still needs to be done in this area before firm recommendations can be made about this type of management approach. ↑ Maihofner C, Handwerker HO, Birklein F (2006) Functional imaging of allodynia in complex region pain syndrome. Neurology 66(5): 711-717. ↑ Walteros C, Sanchez-Navarro JP, Munoz MA, Martinez-Selva JM, Chialvo D and Montoya P (2011) Altered associative learning and emotional decision making in fibromyalgia Journal of Psychosomatic Research 70: 294-301. ↑ Legrain V, Van Damme S, Eccleston C, Davis KD, Seminowicz DA and Crombez (2009) A neurocognitive model of attention to pain: behavioural and neuroimaging evidence Pain 144: 230-232. ↑ Legrain V, Van Damme S, Eccleston C, Davis KD, Seminowicz DA and Crombez (2009) A neurocognitive model of attention to pain: behavioural and neuroimaging evidence Pain 144: 230-232..
↑ Moseley L and Flor H (2012) Targeting cortical representations in the treatment of chronic pain: a review. Neurorehabiliation and Neural repair 26(6): 646-652.